Target shares fall sharply in premarket trading after the retailer posts weaker-than-expected first-quarter earnings and slowing comparable-sales growth. Target Corp. (TGT - Get Report) posted weaker-than-expected first quarter earnings and slowing comparable store sales growth, but held to its full year outlook amid increasing competition from rivals such as Amazon.com Inc. (AMZN - Get Report) . Amazon is a holding in Action Alerts PLUS. 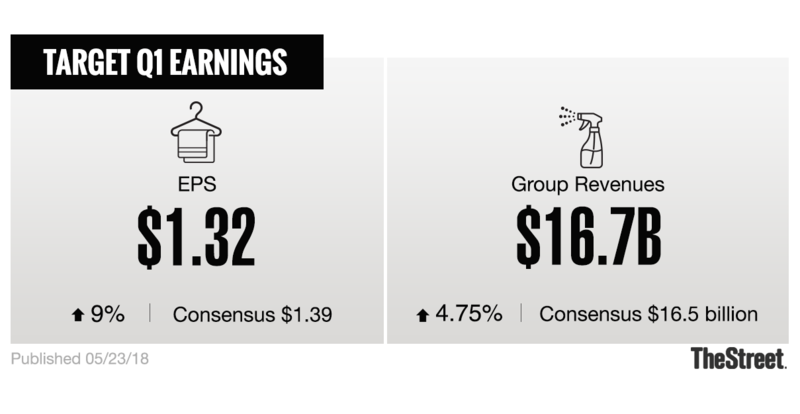 Target said adjusted earnings for three months ending in April came in at $1.32 per share, up 9% from the same period last year but well shy of the consensus forecast of $1.39 per shares. Sales for the period, Target's fiscal first quarter, rose 4.75% to 16.782 billion, topping analysts' forecasts of $16.5 billion. Comparable store sales, however, grew by only 3%, down from the 3.2% pace recorded in the previous quarter, and the company said it sees second quarter comparable sales to grow in the 'low to mid single-digit range". First quarter traffic, however, improved to 3.7%, the company said, the best in a decade. "We're very pleased that our business continued to generate strong traffic and sales growth in the first quarter, as we made significant progress in support of our long-term strategic initiatives," said CEO Brian Cornell. "Our first quarter performance reflects the benefit of our unique multi-category portfolio. Strong sales growth in our home, essentials and food & beverage categories offset the impact of delayed sales in temperature-sensitive categories, which accelerated rapidly in recent weeks as weather improved across the country. Minneapolis, Mn.-based Target said it still sees second quarter adjusted earnings of between $1.30 and $1.50 per share and full-year adjusted earnings of between $5.15 and $5.45 per share.